Mac McQuown shows a weathered appearance from the sun which certainly did not interfere with the spirit of his discourse at Jim Satcher Ford last week. Mac McQuown was “holding court” at Jim Satcher Ford in Johnston, Wednesday afternoon, June 20, and he was surrounded by many interested people who wanted to know about this journey he is taking. Already he has walked over a thousand miles as a way to bring awareness to the wounded veterans and their needs, as well as to veterans who are homeless. McQuown began his journey on Sept. 11, 2011 in Stafford, Virginia. He has made his way to Ground Zero. One young man at the Satcher Ford business on Wednesday, Trip Harrison, was excited to talk with this traveler. McQuown was an inspiration for him. Trip is the son of Sarah Rutland who works at Satcher’s. Passionate about his cause, Mac has weathered a lot of adversity, including a heel spur that is slowing him down. He says the spur doesn’t bother him every day so he keeps going. On this day, the 20th, he was wearing brand new boots that obviously were giving good support. He had just come in from Charleston area and was headed out, and after walking to Edgefield, then to Florida. This cart carries the necessities for the walking Marine, Mac McQuown. As he walks he pulls a cart behind him. This cart is separated into three parts and he has clothes, food and other things stored there. What kind of food? Health bars and beef jerky. On one level there are first-aid supplies, also, and tools and spare parts. 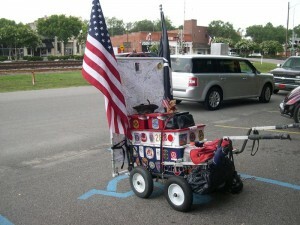 The cart holds flags, which call attention to the patriotism he is exhibiting. The cart weighs 50-60 pounds and he pulls it by a harness that fits over his shoulders. Where does this man sleep? He says, “in fire stations, peoples’ homes, sometimes in a hotel or inn” if someone treats him to this comfort. That happened in Edgefield when the owners of the Edgefield Inn gave him a room on Thursday night before he headed out on Highway 25 S. to Florida. On Wednesday night he got an invitation from David Satcher, the Ford Company’s owner. He stayed in their home as their guest. Mac says, “This walk has changed me.” He is writing two books, one on “Crossing Paths” which tells of the many people he has met. So, look for a man walking in fatigues, pulling a cart; he may need a place to bed down in this cause of his. He certainly showed energy and enthusiasm for his country and those who serve in the armed forces, even after a long, long walk that he figures will take him 6 years to finish. His goal is to visit the steps of every capitol of the 50 states. Mac has not wife or girlfriend, as he puts it, but he does have a 23-year-old daughter. Therefore, he is not leaving behind anyone in need of him. He raises money as he travels, such as a fish fry fundraiser in Lexington planned by friends. Should you want to help him you may reach him via his website or email him. 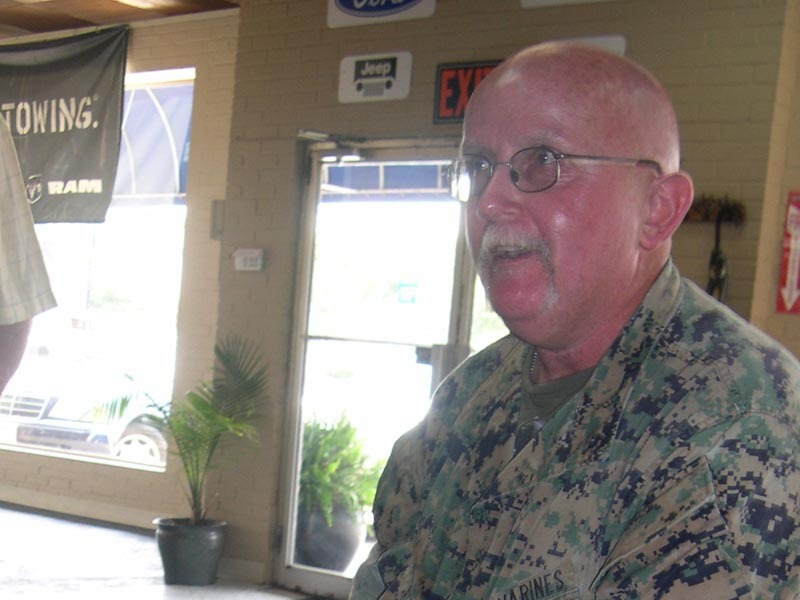 One Response to "Marine Walks the Countryside With a Purpose"
It is so commendable what you are doing. God Bless You, and THANK YOU. Sorry I missed your visit. Just got back from D.C. when you were here, but, heard all about your visit from David Satcher at Satcher Ford in Johnston, S.C. where I just took my car in. Currently, I am serving an Active Duty tour at Ft. Gordon. I am a physician assistant and do medical boards for our wounded warriors. You are truely an inspiration.